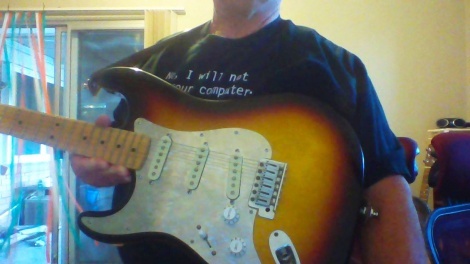 Neil's Sunburst Strat in Carnarvon WA. With Customised Strat Lefty 'Flecker' Pickguard. Hey Neil awesome, it's a fit. We did it! Thanks for your fab pic, over there in Carnarvon. Another photo closer of Neil's 'Flecker Lefty' guard. Great to see the Lefty players, the 10% are in the deal !